As baseball fans eagerly await the start of the 2019 season, the Voyagers look forward to welcoming back our Championship winning coaching staff. The Voyagers are excited to announce the return of Tim Esmay, the manager who led the Voyagers to their Pioneer League Championship victory this past season. There will be a lot of familiar faces from our Championship winning team as John Ely returns as the Pitching Coach, and Tyler Gniadek as the Strength and Conditioning Coach. The one new face in 2019 will be Hitting Coach Cameron Seitzer . Esmay will be entering his fifth season in the Chicago White Sox organization. His first was as a manager for the Winston-Salem Dash in 2015. Prior to working for the Chicago White Sox, Esmay managed at Utah and Arizona State. Ely is entering his third season in the White Sox organization and third with the Voyagers. Ely started his baseball career in Great Falls in 2007 after being selected in the third round of that year's draft. He pitched in 13 games and held a 6-1 record with a 3.86 ERA. He made his major league debut on April 28, 2010 with the Los Angeles Dodgers. His final year in the minors was in 2015. Gniadek is also entering his third season in the White Sox system and third as conditioning coach with Great Falls. Prior to working with the Voyagers, Gniadek spent the 2016 season as the strength and conditioning coach with the Orem Owlz. Before that, he interned with the Colorado Rockies and Triple A sport consultants. Hitting Coach Cameron Seitzer is entering his first year as a coach in the White Sox organization and Great Falls. In 2011 he was drafted as a first baseman by the Tampa Bay Rays. In 2016, he was signed by the White Sox and spent his 2018 season as a pitcher for the Winston-Salem Dash. 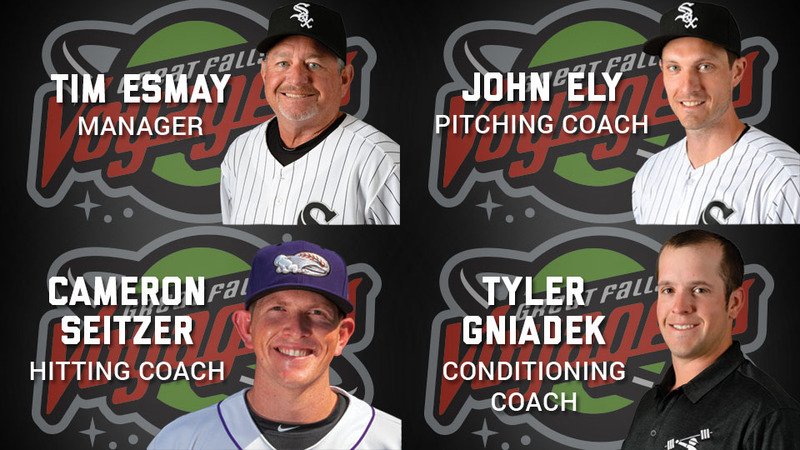 The Voyagers would also like to acknowledge some of our previous coaching staff members for their continued success in the White Sox organization: former Voyagers Manager and Hitting Coach, Charlie Poe; former Voyagers Hitting Coach, Justin Jirschele; former Voyagers Pitching Coach, Matt Zaleski; former Voyagers Manager, Ryan Newman; former Voyagers Manager, Cole Armstrong; and former Voyagers Hitting Coach, Gary Ward. The following is a full list of all White Sox coaching changes for the 2019 season. Chicago White Sox Farm Director Chris Getz will be hosting a press conference for Chicago media members at 8am mountain time tomorrow. 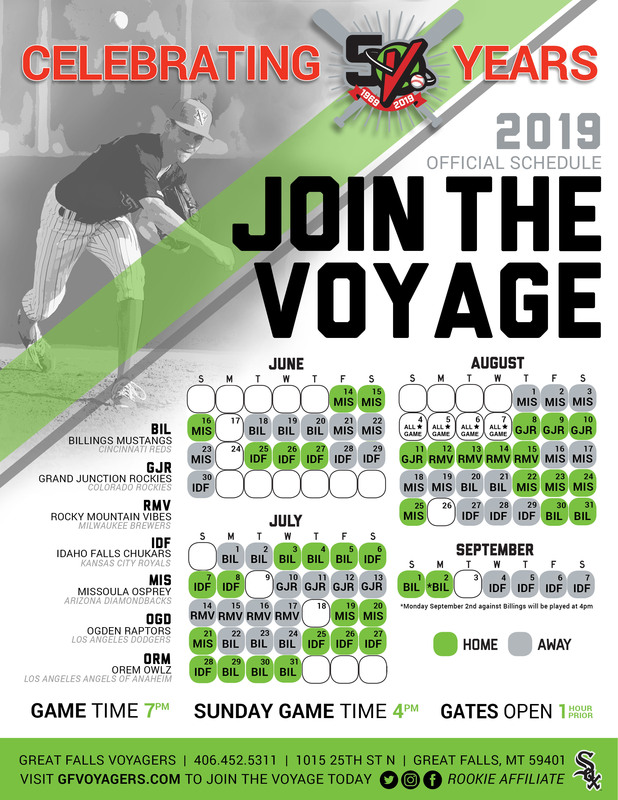 Anyone interested in dialing in can get that information by reaching out to Voyagers General Manager Scott Reasoner at Scott@gfvoyagers.com.